Add a geographic search box to your app with a couple of lines of code. The widget defaults to the ArcGIS Online World Geocoding Service but can be customized to use one or more ArcGIS Server geocoding services. Check out the samples that use this new widget. The map class has new constructor options that can help you get your map set up using less code. basemap: ArcGIS.com basemap. Possible values: "streets", "satellite", "hybrid", "topo", "gray", "oceans", "national-geographic" or "osm". center: Array of two coordinates (longitude, latitude) or an esri.geometry.Point. zoom: Starting zoom level for the map. minZoom: Smallest scale zoom level for the map. maxZoom: Largest scale zoom level for the map. The map now auto-resizes so it is no longer necessary to set up an event listener for resize events on the map's container to call map.resize when a map's container resizes. Below is a comparision of pre-3.3 code and equivalent 3.3 code. Two new map methods, getBasemap and setBasemap, make switching basemaps easy. 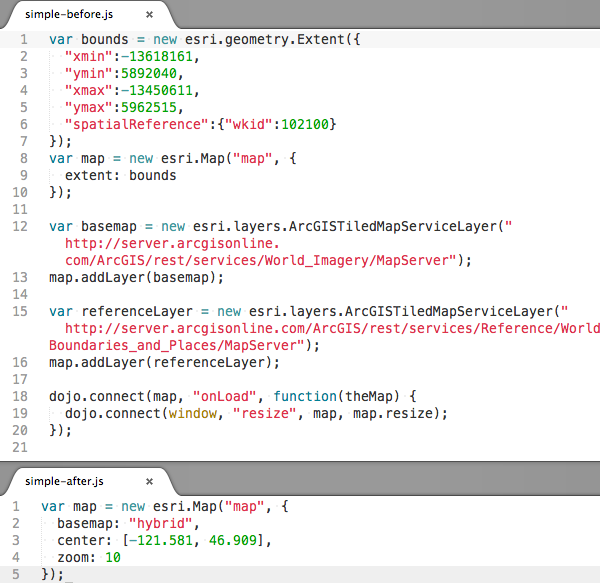 setBasemap accepts one of the strings mentioned above that corresponds to an ArcGIS.com basemap. If map.options.basemap was used to initially set the basemap, or the map's basemap was set with setBasemap, getBasemap will return the string that corresponds to the map's current basemap. The map zoom controls now default to a "+" and "–" instead of a slider. The slider is available by passing sliderStyle: "large" to the map's via the constructor options object. The map no longer requires a tiled or dynamic service to be the first type of layer added to the map. View the new Feature Layer in any projection sample to see this in action. esri.geometry objects created without a spatial reference are assumed to be geographic and default to a spatial reference of WGS84 (wkid 4326). Instances of esri.geometry.Point have two new methods: getLatitude and getLongitude which return latitude or longitude if the point has geographic or web mercator coordinates. Otherwise, these methods return undefined. The map also has a geographicExtent property when the map is in geographic coordinates or web mercator. The draw toolbar's rectangle, triangle, circle and ellipse tools support click + drag to define the size of each shape. The toolbar now also includes options to draw arrows in specific directions (up, down, left and right). The new options are shown in the drawing tools sample. New redraw method for feature layers that redraws features without going back to the service. Pass a function instead of an attribute field name to a class breaks or unique value renderer to calculate values used to renderer data. Class breaks renderers now include a setMaxInclusive method to specify whether or not features that match the max value in a symbol class should be included in that class. Edit toolbar has a new option, uniformScaling, which preserves aspect ratio when resizing graphics. Creating a geometry without specifying a spatial reference defaults to WGS84 (wkid 4326). Apps that previously created geometries with non-WGS84 coordinates without a spatial reference now must specify the geometry's spatial reference. The default map slider style has changed at 3.3. The slider with ticks is no longer the default but is still available using sliderStyle: "large" when creating a map. NIM087469 ArcGISDynamicMapServiceLayer.setDynamicLayerInfos() does not correctly handle esri.layers.DynamicLayerInfo objects created from JSON. NIM087472 Cannot create multiple time sliders on the same page. NIM087499 Editor: When specifying a custom attribute inspector an empty popup window is displayed when selecting a feature. NIM087510 esri.layers.WebTiledLayer breaks when using the compact build of the API. This is because that class does not explicitly require dojo.string but it uses dojo.string.substitute. NIM088021 Printing: add a new property to esri.tasks.printTemplate as "showAttribution" to turn on/off the attribution for the printout. NIM088026 Printing: If a featurecollection has features without geometry, the print task shouldn't include those features. NIM088035 Printing: PrintTask should exclude invalid images, those don't have valid URL or ImageData property, from MapImageLayer. NIM085927 Printing: When executing print task, feature collections created based on featurelayer should show the layer name or id in the legend. NIM088023 Save normalized extent when bookmarking an extent crossing date time line or beyond the original world. NIM088033 The default value of esri.esri.tasks.ClosestFacilityParameters.directionsTimeAttribute should be "null", instead of "false". NIM088025 TimeExtent: startTime and endTime values lose millisecond precision in Firefox and IE when creating a TimeExtent object with start and end parameters. NIM083409 When editing attribute value as "0", applyEdits sends "". NIM088022 Overview map widget shows esri logo in IE7.